Our nylon lifting slings category continues to expand with the most recent addition of 600+ new Nylon Bridle Slings. A nylon bridle sling offer s both incredible strength and ease of use due to its light weight and ability to collapse for easy storage. Four configurations available (single leg, double leg, triple leg, or quad leg) to meet a variety of applications. The synthetic nylon is more flexible than chain or wire rope. Quality hardware from Pewag ensures quality. Oblong links are manufactured in Grade 100 alloy steel; hooks are all in a Grade 80 alloy steel. Each bridle sling leg stretches approximately 3% at rated capacity, helping to absorb shock during a lift. Nylon fabric will not conduct electricity like a chain sling or wire rope sling. 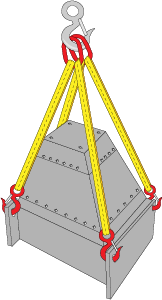 Multiple leg design in the 2-, 3-, and 4-leg styles allow the bearing points to be rotated, which extends the sling’s working life. Available in two different ply thickness. The 2-, 3-, and 4-leg styles can be used in different hitches, offering excellent versatility. We offer three end fittings online- oblong, hook, and sewn eye. Each sling also has a master oblong link. Two widths (1″ and 2″) and two ply options (1-ply and 2-ply) are also available for order online. Other recent additions to the nylon sling category include Drum Slings and Drum Lifters, as well as a request quote form for Custom Boat Slings. Like all of our nylon slings, our nylon web bridle slings are made in the USA. If you don’t see the sling you need, give us a call. We’re always happy to customize a bridle web sling assembly to your specs. You can reach our lifting slings product team at 800-660-3585. Click over to our website to see all of our Lifting Slings & Rigging Slings, or click the buttons below to go directly to each category of nylon bridle slings.